Here's a card using the Tonic Studios Pick of the Day Small Dainty Bows Die Set. I started off by cutting a Teal square card out of an A4 sheet of card, I cut a silver glitter layer and a white felt card layer. I rounded the corners on all of these. I die cut the Small Dainty Bow in teal and white and layered them before sticking the bow together. The Rococo Hot Cocoa Die was cut again out of teal, white and silver glitter. Using the white as a base, the teal cup was cut out and paper pieced on top along with the silver candy cane and bow. I backed the white foam of the cocoa with the remnants of the silver die cut just to give some depth. 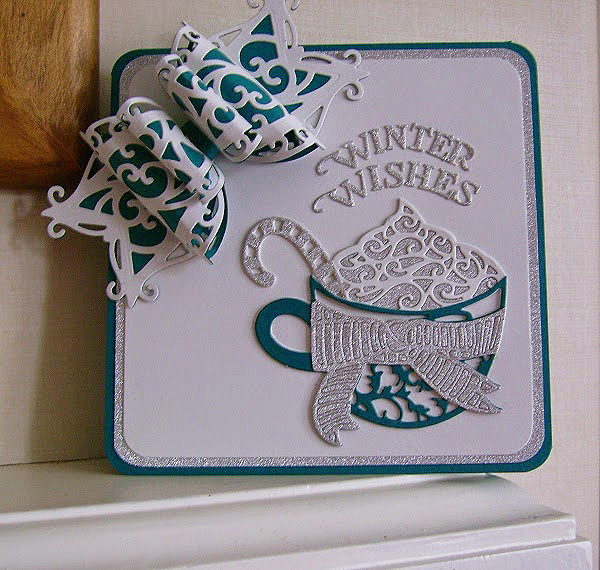 The Winter Wishes wording is cut from the Christmas Wishes Header Die Set with the individual letters being curved over the top of the cup and glued into position. The bow was stuck down at an angle over the corner. This is quite a simple card to make but with the added paper piecing I think it makes quite a focal point.